I put the painting on his favorite chair. Ok, I give in. Mostly because Adam called me a wimp in my comments. Boo hoo – now I’m crying but when I’m done I’m gonna show you and post that dumb painting! That’ll show you…. 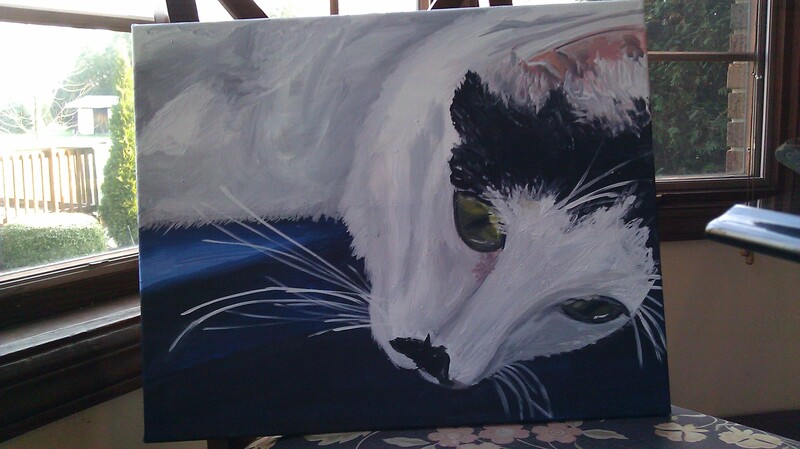 Here is the painitng of Mr. Smudge. It’s on his favorite chair to add to the realism. I know you might think I’m crazy for being all weird about it, but perhaps that’s just the ol’ perfectionist in me rearing her little big head. And I guess in fairness/to toot my own horn (I’m not THAT critical of myself, yo) this is my 3rd attempt at something “realistic” and my first cat painting beyond a cattoon. I decided not to post the photo with it, though because the angles are off a bit and that’s my beef with it. And my prerogative not to share. And I’m now Bobby Brown. Minus the drugs, singing, and crazy relationships. Wait, didn’t Britney do a cover of that song? Same differences apply here, too, then I suppose. This is a bit crazy even for me. This cat has a forever tophat. This is beautiful. I mostly do landscapes because no one can tell if the angles are off a bit if they don’t see the photo. You’ve caught some definate cat-itude in the eyes which is wonderful!